Send your email subscribers one of our fully customizable email newsletters. And here's the best part: no matter which email type you choose to send, all email layouts can be fully customized with your paper banner, subject line, email alias and a personal message or call to action. Get started today! From your Paper Settings Dashboard, click Newsletter Service. 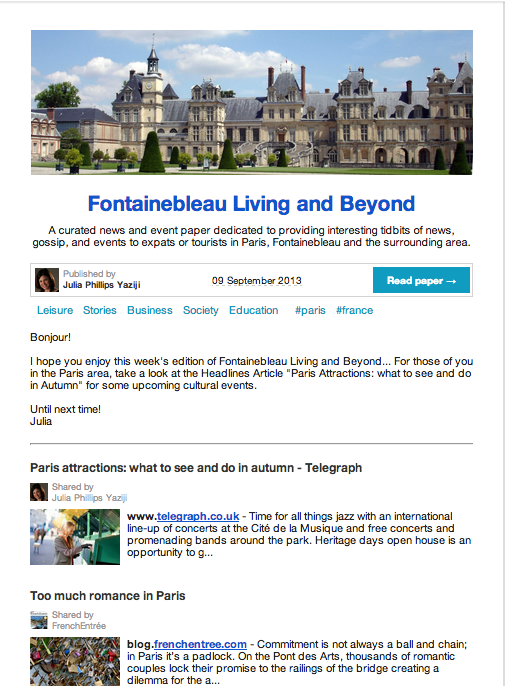 Click Newsletter layout to choose and edit a layout. Simple notification: sends the featured article. Headlines only: sends all articles in headlines section. Full newsletter: sends all articles on the front page of your paper. * Include a text email alias. Emails are sent from noreply@paper.li (if using paper.li to send your emails) but adding a text email alias will show your name in the subscriber's inbox. Send your newsletters using the paper.li email service. With this option, emails are sent from "noreply@paper.li" but can be customized with a text alias that shows in the subscriber's inbox. We are required by law to include in the footer a statement "Email powered by Paper.li". * If you would prefer to add your own email address to replace "noreply@paper.li" and remove the footer "Email powered by paper.li", you may prefer to send your newsletters via Mailchimp or another third party service. These two options are not automatic however. See links above for more details. Don't forget! As the publisher of a Pro paper, you have the option to send out your email notifications automatically with each new edition -or- you can enable manual promotion which allows you to control when you promote your paper to your subscribers and to your activated social media channels.